Marketcircle Blog Are You Failing Enough And Failing Right? If you’ve watched the Super Bowl LIII recently, you may remember Amazon’s 2019 blockbuster advertisement this year titled: “Not Everything Makes The Cut.” It was about failure, either through planning or execution, and ultimately learning from those mistakes. Failure’s a necessary part of life. Life, if we may wax poetic for a moment, is about growth. We can only walk before we run and there’ll be a lot of tripping in between. The overarching point around failure is that we learn from those moments. In Sujan Patel’s book, 100 Days of Growth he outlines how to turn your failures into successes by thinking of failure instrumentally. Failure isn’t just a roadblock or the culmination of a dead end, but an instrument in successful lead generation, business creation and confidence. It’s going to happen. You may not like the sound of it, but it’s the truth. As a person who’s created community organizations and helped start small businesses (some which failed) it’s an unpleasant but ultimately inevitable part of the process. Picking yourself up and dusting yourself off is only half of the battle. Being open to learning from your mistakes and recognizing your shortcomings and more importantly which aspect of your business, sales or marketing procedures worked and what didn’t is a vital component to achievement in the future. It’ll be painful too, no doubt. Having (or growing) a thick skin is key. It’s important that you not think of your failures and especially your shortcomings in the context of your business as irreparable character flaws. See your personal bad behavior as soft-skill either in need of improvement or bad habits which can be extinguished. The “perfection trap” is something many of us are guilty of. We all want to do a good job, nay, a great job! We need everything we produce, all of the time, to meet our exacting standards! Steve Jobs was famous for this type of thinking. Not even the best laid plans survive contact with reality. That’s part of life, we must learn to accept this. It’s about managing your expectations. Those in your business focusing on lead generation and follow-up may not always go as planned. Your plans don’t need to be “perfect” down to the last detail, nor will external circumstances ever allow for this. Practicing failure makes you more dynamic in situations and aware of the ebb and flow of arising opportunities. It’s all organic. Secondly, practicing failing on a weekly basis allows you look at your own cognitive heuristics, or how we rapidly interpret our environment mentally. By doing a post-mortem on your way of looking at the world and where you’ve either missed an opportunity or pursued a red-herring can ultimately lead you to seeing not just hidden development opportunities both on a micro or macro scale, but set you up to recognize your own shortcomings when engaging in similar tasks in the future. Like how a coroner examines a corpse, go through your failures and find the cause of death (sorry if that was too morbid). Failing once and writing it off as a dead-end without any reflection truly is a failure. Remember, failure is just another instrument in your arsenal. Stop thinking about it like garbage. Do a post-mortem. Go back to your initial plans and do a breakdown of the areas that you’ve documented were the weakest. Never done a post mortem? Read how we use Daylite to do them. 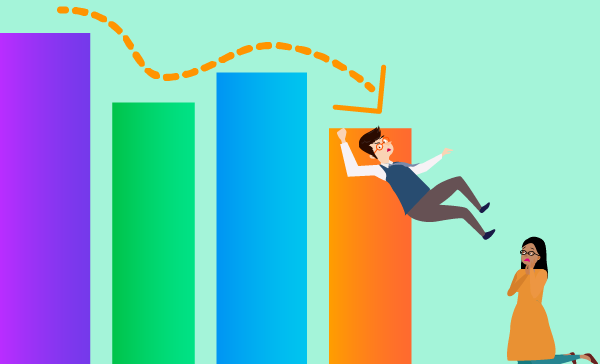 Are your sales declining? How many repeat customers do you have? Is your lead generation slowing? How and where are you attracting new customers from? Be open to asking yourself these things. Don’t be afraid to go back to the basics. Learning from failure is just as much about opportunity as it is about anything else. Did your first plan fail? Pivot your ideas or services to come at the market from a different angle. Build your focus, start over if you have to and go back to the development stage if that will help. Chinks in the armor can be at any level of your business, the key is identifying them and rectifying the situation before it starts cutting into your customer base or worse – your culture. It’s not all doom and gloom! Celebrate quick wins when possible. It’ll help morale and can help push past mental blocks and past missed opportunities. Try to remain fresh and not procrastinate (easier said than done) but through reflection on your own bad behaviors you can learn to ultimately crush them before they lead to larger problems. Learn how to leverage your strengths and bolster your weaknesses. Once again, don’t be afraid to ask for help where it’s applicable. Sometimes having a fresh pair of eyes can be a tremendous boon. Others can help see solutions to problems where maybe it’s been overlooked. Don’t be like Harrison Ford and his dog in the Amazon commercial – if your problem is with another individual, talk it out before things become too insurmountable. Perhaps most importantly, grow and build your confidence. You have strengths, you can identify and work on your weaknesses – this is something to be proud of! You’ve built momentum, use your abilities and your entrepreneurial attitude to push yourself and your business further than before. Remember failure is a tool for seeking and exploiting new opportunity, not just a irrevocable tragedy.